1. Blend all the above ingredients till smooth. 2. 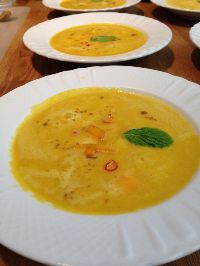 Put a few mango pieces from the garnish in the soup bowl, then pour the soup. Garnish with cilantro leaves and a sprinkle of roasted cumin powder.